Accord 10 x 6 Unfinished Wood Return Air Grill Discounts Apply ! These 10 x 6 oak vent covers will be delivered to your home ready to be stained or painted. Use wood air return grilles to cover up hot or cold air duct openings. 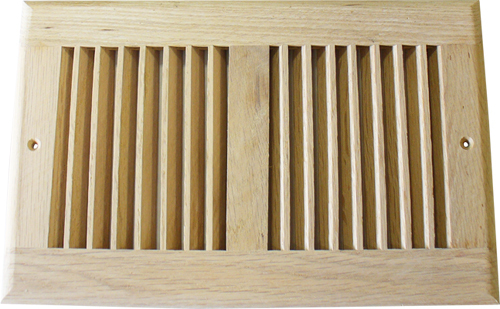 Our oak vent covers are constructed out of North American red oak and will match most wooden trim. These 10 x 6 wood air return grilles can be mounted onto your wall or ceiling. The oak vent covers have two pre drilled screw holes and will come with mounting screws for fast installation. Use the wood air return grilles in your home and replace traditional metal registers with something more homey. ***Hint: Correctly order your wood air return grille by measuring your duct opening in the wall or ceiling. The 10 x 6 oak vent covers fit over a 10 x 6 duct opening. The outer wood air return grille faceplate will vary in size. Available are oak vent covers in a light oak finish in both a 10 x 6 and 12 x 6 size, saving time and money. Order these wood air return grilles in your home or vacation spot to bring out your wooden trim!